Home News Ryanair and the missionary nun! Ryanair and the missionary nun! Sr Maud Murphy, a member of the Sisters of St Louis, received a cheque for €4,000 from Ryanair to celebrate the fact that she was the 4 millionth Ryanair passenger to use Ireland West Knock Airport. 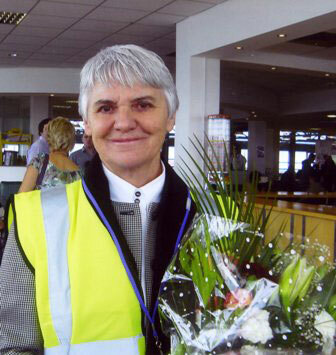 Sr Maud had just arrived from Stansted Airport, to be taken into the arms of Michael O’Leary, Ryanair CEO. Coincidentally, Sr Maud’s mother was on the first ever flight out of Knock. Sr Maud is donating the money to three charities: one in Nigeria, where she taught for 16 years, and to the Community Cenacolo Rehabilitation Centre in Knock and the Western Alzheimer’s Centre, Ballindine. At present, Sr Maud is working as an addiction counsellor.